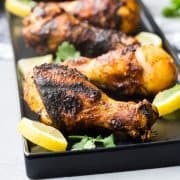 These flavorful grilled chicken shawarma drumsticks are going to become a summertime favorite! With the flavors of chicken shawarma that you know and love, you’ll want to plan on putting this recipe into regular rotation! We moved to the Grand Rapids area of Michigan about two years ago. It’s the place I called home for the majority of my life and we absolutely love it here. The food scene is great in Grand Rapids, with new restaurants popping up frequently and many restaurants where you’ll find a two hour wait because they’re so hot. However, we came from the East side of the state, a more diverse area, full of fantastic ethnic food – Middle Eastern in particular. Ben grew up in Dearborn, Michigan and also worked there for four years. Dearborn has a very large Arab American population, so the food is authentic and so delicious. I’m incredibly spoiled and nothing in Grand Rapids holds a candle to the food in Dearborn. Before I married Ben and moved to that area, I had little to no exposure to this type of food. Now, it’s my favorite. I crave fattoush like other people crave ice cream. Lebanese lentil soup is what I crave when I have a sore throat, and losing the ability to keep hummus in the house when we found out about N’s allergy to sesame was a very sad day (although my tahini-free hummus helps satisfy the craving!). Not to mention delicious tahini sauce, which is most definitely a no-no these days. Chicken shawarma, shish tawook, and chicken kofta are some of my favorite ways to enjoy chicken. Oh and tabbouleh! So many favorites these days from living there for 8 years. 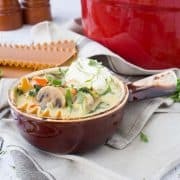 I try to bring these flavors into my recipes frequently because I love them so much, and I know they’re popular with a lot of you, too! 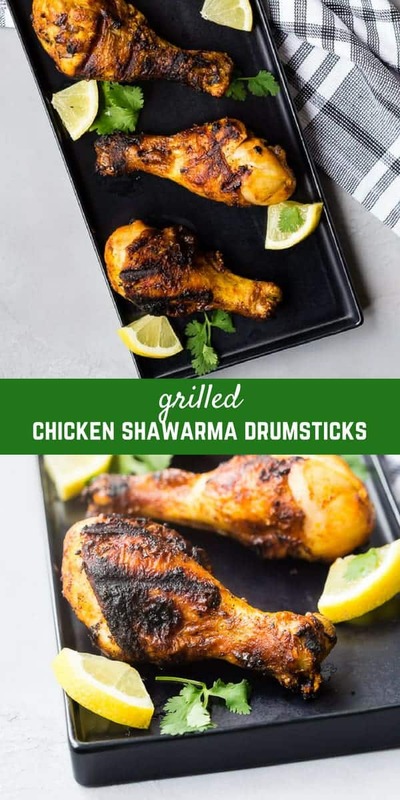 These grilled chicken shawarma drumsticks are perfect for summer grilling and they’re so easy to make with less than 30 minutes hands-on time. 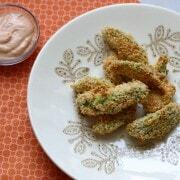 Drumsticks are inexpensive, kids love them, and they’re perfect for a busy summer night. These are fantastic with roasted potatoes, grilled vegetables, rice, salad…basically anything at all. The base of this flavorful marinade is lemon and olive oil, accentuated by the spices you’d expect in shawarma: Garlic, paprika, turmeric, pepper, cumin, coriander. 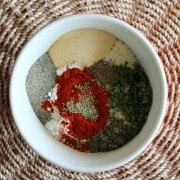 If you like things on the spicy side, try adding some cayenne to the marinade. In a measuring cup or small bowl, whisk together lemon juice, olive oil, garlic, paprika, salt, turmeric, pepper, cumin, coriander, and cayenne. Add marinade to drumsticks (I use a zip-top bag but a bowl or baking dish would work as well). Let marinade for at least 30 minutes up to 6 hours. When ready to grill, heat grill to medium heat. Remove drumsticks from marinade, letting excess drip off. Place drumsticks on grill and cover grill. Grill for 18-10 minutes, turning once, or until chicken reaches an internal temperature of 165°F. Serve immediately. Nutrition Information calculated with 1 tablespoon olive oil since most of the marinade is discarded. Verdict: I loved these grilled chicken shawarma drumsticks! I loved the crispy skin and the flavor of the meat. We’ll be making them frequently this summer! Husband’s take: Ben loved these! E did too…N still doesn’t like anything and is 95% vegetarian despite our best efforts to feed the kid meat. Changes I would make: None at all are necessary but I might try the marinade with chicken breasts or boneless thighs. So so good!! Did a mixed pack of drumsticks and thighs! And with the leftovers shredded off the bone and made pita pocket Sammie’s with a tzatziki sauce!! I’m so glad you liked them! I looooove your repurpose of the leftovers….sounds amazing, can’t wait to try that myself! wow! sounds fun to eat. Sounds yummy. Can’t wait to try this recipe.